Diaper Rash Remedy Discounts Apply ! 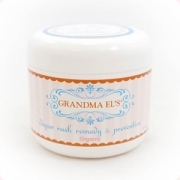 Grandma El’s Diaper Rash Remedy brings an end to diaper rash fears – without messy white paste. Made of 100% natural and organic ingredients, Grandma El’s Diaper Rash Remedy is hypo-allergenic, preservative free, doctor tested and recommended. Use after every diaper change to prevent diaper rash and protect baby’s sensitive skin. One jar lasts 8 – 12 weeks when applied after every diaper change. Grandma El’s Diaper Rash Remedy is also a great remedy for baby’s cradle cap, chapped cheeks, sunburn, eczema and dry skin patches. Buy by itself or as part of a gift pack.